Welcome, from the Estate Planning Council of Cleveland! The Estate Planning Council of Cleveland is a multi-disciplinary organization of over 400 members who share a common belief that a client is best served by the team concept of estate planning. We admit to membership attorneys, trust officers, accountants, insurance and financial planners,planned giving professionals, as well as allied professionals. This website is intended to help you find qualified professionals, informative articles, and other resources related to estate planning. For example, you will be able to link to other sites providing more information about our members and the services they offer by clicking on the member directory. Please browse at your pleasure; be aware however, that certain links are reserved for members only and require password access. 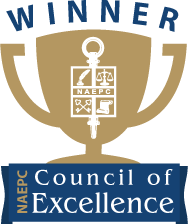 We are thrilled to announce that EPC Cleveland was named a 2018 Council of Excellence by the National Association of Estate Planners & Councils! EPC Cleveland has been named a Council of Excellence for 3 years in a row! 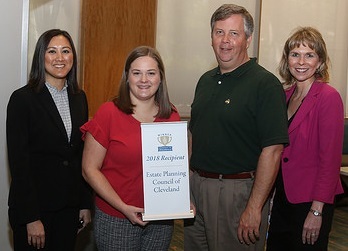 The Estate Planning Council of Cleveland is a member of the National Association of Estate Planners & Councils, a national organization of professional estate planners and affiliated local estate planning councils focused on establishing and monitoring the highest professional and educational standards. The Estate Planning Council of Cleveland offers this site for informational purposes only, to provide a better understanding of estate planning, and to further the education of our members and the general public in the field of estate planning. The contents of this site are not intended as legal, tax, accounting or other professional advice or services and is presented without any representation or warranty as to the accuracy or completeness of the information. All uses of this website, other than personal uses, are prohibited. The information on this site is subject to change without notice, and you may not rely upon any such information with regard to a particular matter or set of facts. You should not act or refrain from acting on the basis of any content included in this site without seeking the appropriate legal or professional advice on the particular facts and circumstances. ALL INFORMATION IN THIS SITE IS PROVIDED “AS IS”, WITH NO GUARANTEE OF COMPLETENESS, ACCURACY, TIMELINESS OR OF THE RESULTS OBTAINED FROM THE USE OF THIS INFORMATION, AND WITHOUT WARRANTY OF ANY KIND, EXPRESS OR IMPLIED, INCLUDING, BUT NOT LIMITED TO WARRANTIES OF PERFORMANCE, MERCHANTABILITY AND FITNESS FOR A PARTICULAR PURPOSE. In no event will The Estate Planning Council of Cleveland, its agents, officers, directors, or employees be liable to you or anyone else for any decision made or action taken in reliance on the information in this Site or for any consequential, special or similar damages, even if advised of the possibility of such damages. Links to information on other sites are for your convenience only and are not an endorsement or recommendation of those sites.